So here's a shocker: It turns out the 1998 asteroid disaster movie "Armageddon" was a tad unrealistic. 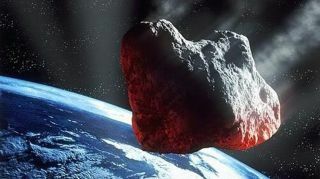 In the film, a team led by Bruce Willis plants a nuclear bomb deep inside a 600-mile-wide (1,000 kilometers) asteroid as it streaks toward Earth. The explosion splits the space rock in two, and the pieces zip safely past the planet, ensuring humanity lives to see another day. But a new analysis by four physics students in England suggests that this asteroid-deflection tactic couldn't possibly have worked. Willis and his band of roughnecks would've needed a bomb almost 2 billion times stronger than anything ever detonated on Earth, the students say. They came up with a figure of 800 trillion terajoules — compared with the 418,000 terajoules produced by history's most powerful blast, the Soviet Union's test detonation of the "Big Ivan" hydrogen bomb in 1961. "I really enjoyed the film 'Armageddon' and up until recently never really considered the plausibility in the science behind the movie," Hall, 22, said in a statement. "But after watching it back, I found myself being more skeptical about the film in many areas. "I think that directors attempt to make films scientifically accurate but find that a lot of trouble is run into in what can and cannot be done, thus leading to falsification in the science to make movies more interesting or visually appealing to the audience," he added. Hall and his colleagues published their results in two papers — "Could Bruce Willis Save the World?" and "Could Bruce Willis Predict the End of the World?" — in this year’s University of Leicester Journal of Special Physics Topics, which features original studies conducted by students in the final year of the four-year program toward a Master of Physics degree. While "Armageddon" got some big things wrong, scientists do think humanity can deflect many dangerous asteroids if they're detected early enough. Most researchers regard a nuclear explosion as an option of last resort, however – something to try if the clock is really running out. With years or decades of lead time, a so-called "gravity tractor" probe could be launched to rendezvous and fly with the asteroid. Over time, the spacecraft's subtle gravitational tug could pull the space rock into a more benign orbit. Or a kinetic impactor could be slammed into the asteroid in deep space, knocking it onto a different path. But this might be tough to achieve when it is the 600-mile-wide "Armageddon" asteroid, which is about the same size as the dwarf planet Ceres.